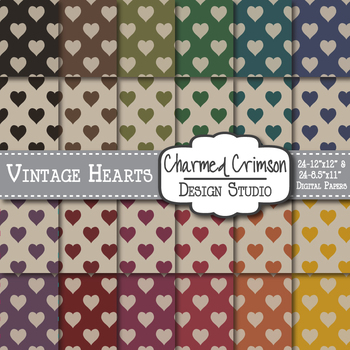 A rich pack of 24 vintage hearts digital papers in two sizes. Colors include gold, pumpkin, scarlet, merlot, burgundy, plum, navy, teal, olive, hunter, chocolate and black. 1175 - Copyright 2015-2019 © Charmed Crimson ~ All Rights Reserved.